Alton Minor Coppage (February 8, 1916 – January 9, 1992) was a professional American football end who played five seasons in the National Football League (NFL) and All-America Football Conference (AAFC), mostly for the Chicago Cardinals. Coppage grew up in Oklahoma and attended the University of Oklahoma, where he was part of a 1938 football team that won the school's first Big Six Conference championship. He was drafted by the NFL's Cardinals in 1940 and played in Chicago for three seasons before leaving to serve in World War II. He signed with the Cleveland Browns in the AAFC after his discharge from the military and played one season for the team, moving to the Buffalo Bills in 1947. After leaving football, Coppage settled in Oklahoma and worked in lumber and banking. He died in 1992. Coppage grew up in Hollis, Oklahoma and attended the University of Oklahoma in Norman. He played football as an end for the Oklahoma Sooners for three years starting as a sophomore in 1937. Coppage was a member of a 1938 Sooners team that went undefeated and was ranked fourth in the country by the Associated Press before losing in the Orange Bowl to Tennessee. Despite the bowl-game loss, the Sooners won their first-ever Big Six Conference championship. 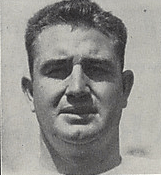 Coppage was selected by the Chicago Cardinals in the 1940 NFL Draft and played for the team for three seasons before leaving to serve in the Pacific theater of World War II. After returning from service as a corporal in the Twentieth Air Force, he was acquired in 1946 by the Cleveland Browns, a team under formation in the All-America Football Conference. In his one year with the Browns, the team won the league championship. Coppage played for the Buffalo Bills in 1947, his last year in professional football. After retiring from football, Coppage worked in the lumber business and subsequently in banking, spending 20 years as first vice president of First State Bank of Gould, Oklahoma for 20 years. The bank was robbed in 1975 when Coppage was working there with his wife Lillian, an assistant cashier. Two bearded men entered the bank and pistol-whipped Coppage and another bank executive. They stole $300 and abducted two female employees, took them to an abandoned garage and shot both in the head and face; one of them died. Two men were apprehended and charged with the crime. Coppage died in 1992 at Jackson County Memorial Hospital in Altus, Oklahoma. 1 2 "Conkright Leaves Rams For Post With Browns". Cleveland Plain Dealer. February 16, 1946. p. 18. The Browns yesterday announced the acquisition of another National League veteran, Alton Coppage of the Chicago Cardinals ... Coppage, from Oklahoma, is 26, stands six-one and weighs 209. A regular with the Cardinals for three years before the war, he was a corporal with the 20th Air Force and last fall played in the all-star service game in Honolulu. He was released recently. His home is in Hollis, Okla.
↑ "Alton Coppage". Soonerstats.com. Archived from the original on October 6, 2012. Retrieved August 22, 2012. 1 2 "Sooners Due for Another Fine Season". The Milwaukee Journal. Norman, Okla. Associated Press. May 1, 1939. p. 2. Retrieved August 22, 2012. ↑ "Players Drafted by Pro Elevens". The New York Times. December 10, 1939. Retrieved August 23, 2012. ↑ Dietrich, John (November 16, 1945). "Jacobs Rejoins Rams Here, Will Oppose Chicago Cardinals Sunday". Cleveland Plain Dealer. p. 17. Returning also this week are Alton Coppage, a star end, to the Chicago Cardinals, and several others. ↑ "Al Coppage NFL Football Statistics". Pro-Football-Reference.com. Archived from the original on October 6, 2012. Retrieved August 23, 2012. 1 2 "Coppage". Altus Times. Hollis. January 12, 1992. p. 14. Retrieved August 22, 2012. ↑ "Hearing". The Altus Times-Democrat. May 28, 1975. p. 14. Retrieved August 22, 2012. 1 2 Hale, Dave (January 6, 1945). "Gould Bank Robbed; One Dead". The Altus Times-Democrat. p. 1. Retrieved August 22, 2012.